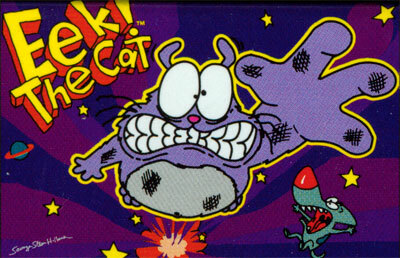 Platform game based on the cartoon series Eek the Cat. Eek must help his friends through 6 huge levels of hazards. This platformer has a novel approach that the player (Eek) can take as much damage as possible, but must keep his protectee safe from harm using various skills. Situations reflect the cartoon. For example, his master the granny is out sleepwalking in the zoo and he must prevent the animals waking her up. In the second level, his girlfriend has been abducted by aliens and he must help her get to the end of the level so the aliens can use her as a battery safely.